The library administration is an interface specific to each library. Library administrators can access it to configure library settings and manage daily activities in the library. 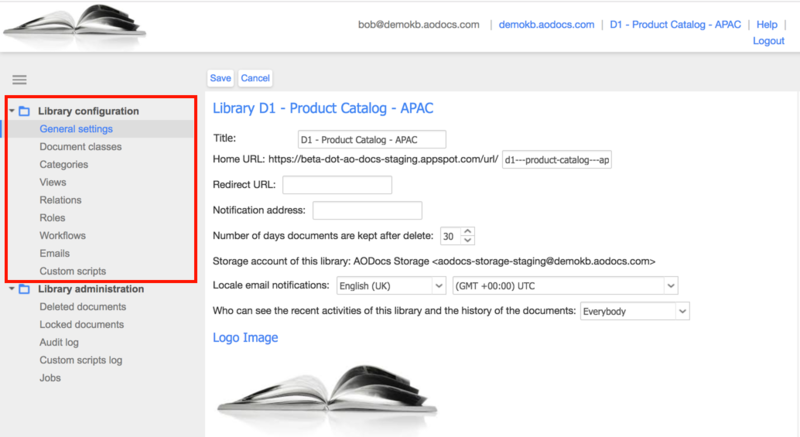 Note: AODocs super administrators can access all library administration interfaces. General settings: You can edit the title, image and description of the library. Learn more: Customize your library homepage. Document classes: To create or import documents in your library, you must configure a document class. Document classes can be used to differentiate documents from the same library. Categories: A category is a property type with a predefined set of possible values. You can list and configure the possible values of categories. Views: You can configure the list of documents, properties, and filters by configuring the views. Relations: You can link documents with each other and display related documents in the document’s properties panel. Related documents can be of the same or a different document class. Roles: You can configure roles that can be used to set permissions and notifications. Workflow: You can configure workflows to define the transitions and states of the documents. Emails: You can use AODocs to transform emails into documents. Custom scripts: You can run custom scripts using the library configuration section. Deleted documents: You can view and restore deleted documents. Learn more: Manage deleted documents and folders. Locked documents: You can view and unlock locked documents. Learn more: Manage locked documents. Audit log: You can view and filter audit logs for your library. Learn more: View the library audit log. Custom scripts log: You can view the logs messages produced by custom scripts running in the library. Learn more: Create custom scripts. Jobs: You can view the list of job streams in your library. You can switch the AODocs domain and choose from all the domains you can access with your account. You can log out of AODocs. This also logs you out of your Google account and all sessions associated with your account, for example, Gmail and Google Drive. 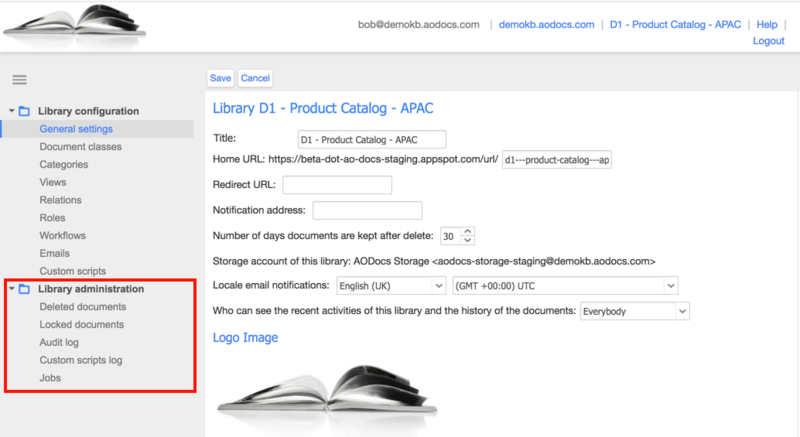 The Quick Help widget allows you to access articles from the AODocs Knowledge Base directly from the library administration interface. You can also contact AODocs support directly in this interface.